a little bit of everything...: How Colorful is Your Life? They were talking about colors, or drawing out a rough draft of your presentation by hand or something... Honestly, I am not sure. 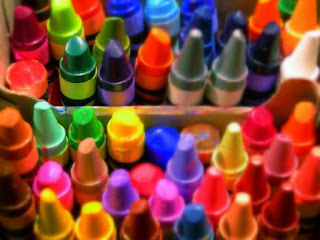 Because I was just completely fascinated by this picture of crayons. Crayons. And I am 31. What got me wasn't that they are Crayola (which they are--as a former teacher, I can spot an impostor from a mile away), or that they aren't in their normal color family organization. What got me was that some of them have obviously been colored with a handful of times, others are worn way down, while some have yet to be used. Not even once. Isn't this how life is? You find a something you like, something that is comfortable, and you do it over and over and over? You try some things out, and they don't really fit with you, so they just go back in the box? But what about those unused ones? Are they not even going to get a shot? Maybe we all have a new favorite color just waiting to be used. Maybe we all need to step out of our comfort zone and try something new. If life is a box of 48 colors, how many are we actually using? Wow! That was deep. Made me want to be a used up crayon!